Chicago’s Star Wars Celebration event started on the right foot this morning with the Episode IX panel. But leading up to the trailer’s reveal, some interesting details came out over the course of the one-hour kick-off. First, Stephen Colbert from The Late Show came out to host. But he noted that he might not actually be there, as he said, “Isn’t it possible I’m Force-projecting myself on this stage?” This was obviously a reference to what Luke Skywalker pulled off in 2017’s The Last Jedi. With that, the director spoke about the film’s production. It’s currently “in the editing room” and “things are going pretty well so far.” He said that he “can’t wait for people to see” what’s in store for the film. The late Carrie Fisher also came up in discussion, as she’ll appear in Episode IX to some extent. Abrams reiterated that they simply couldn’t “fill the void…she was glorious and amazing” when it came to her presence in the films. Cast members began coming out at this point, starting with Anthony Daniels and his robot counterpart, R2-D2. During this time, Daniels talked about a new book he’s working on, but didn’t detail what it’ll be about just yet. Then came Billy Dee Williams, confirming that Lando Calrissian will be back in Episode IX. We also got a first image of him in the film, which you can see from the Star Wars Legacy tweet below. Then the rest of the cast came out. This included Daisy Ridley, John Boyega, Oscar Isaac, Joonas Suotamo, Kelly Marie Tran, Naomi Ackie and BB-8. (No sign of Adam Driver, sadly.) It appears that BB-8 got the most attention, as Colbert had to quiet the crowd down to ask him questions. Several topics got covered over the next few minutes of the panel, including a first look at Ackie’s character, which you can see in Kristian Harloff’s tweet below. We then get a look at a new droid by the name of Dio (or D-0, not confirmed yet). Smaller in size than BB-8, it appears he can hold his own when it comes to mobility and scanning the environment. You can see him in the tweet below from Nibel. Colbert then thanked Abrams and company for coming out to the panel. 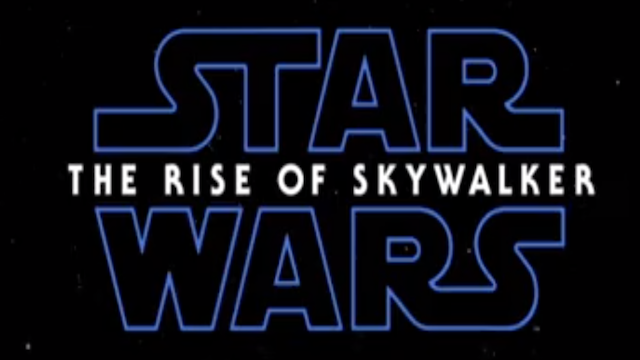 And they did show a teaser trailer for Episode IX, which now officially has the name The Rise of Skywalker. Related: The First Star Wars: Episode IX Trailer Is Here! Then Ian McDiarmid, the Emperor himself, comes out to roll the trailer one more time. And this time, crowd reactions are shown in real time. Star Wars: The Rise of Skywalker hits theaters on December 20. What do you think of the new title? Let us know in the comments below!